Many homeowners in Pensacola and throughout the Alabama Panhandle choose to purchase and live in condominiums. The convenient services provided by a condo association are helpful in eliminating personal responsibility for grounds upkeep and certain maintenance projects. Unfortunately, condo insurance can be confusing. What portion of the building do you own, and what portion of the insurance coverage is your responsibility? If you need help demystifying condo insurance, turn to the dependable, independent agents at Alabama Insurance Agency. 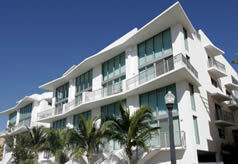 Well take the time to explain liability issues and examine your individual risks as a condo owner. Then weâ€™ll shop our network of reliable insurance providers to find policy options for you. Essentially, condo owners own everything in their units from the drywall in. Generally, what you own will be what you need to insure. However, your condo association agreement might have additions or exceptions to these basic responsibilities. You might be assessed certain fees in the event of damage to certain common areas. Review your homeowners agreement. Then speak with one of our insurance agents to find a condo insurance policy that will address your specific needs. To get started, please fill out the easy online quote form. If you would rather speak directly to an insurance professional, call our offices today.